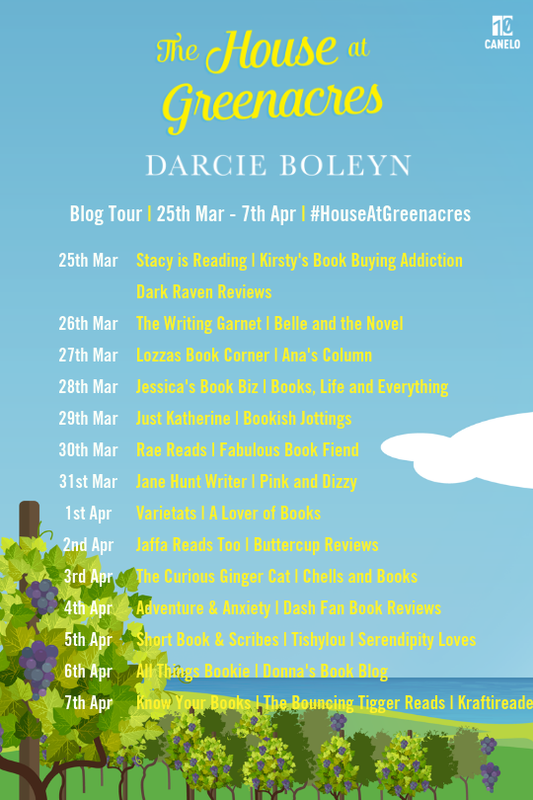 Today is my stop on the blog tour for The House at Greenacres by Darcie Boleyn. I have an extract from the book to share with you and if you like what you read, you can click here to order your copy now! Don't forget to check out the other stops on the tour for more exclusive content, reviews and extracts. Holly entered the kitchen at Greenacres with her granny holding onto her arm. Her father was in front of them, carrying Luke in his car seat, and she was relieved that her son was sleeping soundly after the car journey to the vineyard. She needed some time to take stock and found it hard to concentrate on anything else when Luke was awake and in need of attention. Two women from the catering team bustled around them, offering polite smiles as they removed trays from the oven and set small pasties and pies onto large trays that they carried through to the dining room. ‘I’ll pop the kettle on, shall I?’ Bruce asked, and Holly noticed his eyes wandering over her granny’s face. She had turned very pale. ‘Granny? Are you all right?’ The question seemed ridiculous in light of Glenda’s loss. ‘I’m fine, dear. Except … it hit me that Grandpa is never coming home again.’ She sighed, long and low, seeming to hunch over with the weight of her knowledge. ‘And yet the strangest thing is that another Morton heir has just entered our home. Little Luke has come to fill the void your grandpa left behind.’ She blinked hard, and Holly looked away, her own vision blurring at her granny’s sentiment. ‘I could do with that cuppa now, Bruce, please.’ Granny released Holly’s arm, then removed her black wool coat. Holly took the car seat from him and walked through the kitchen and the dining room. She smiled at some of the mourners who’d come for the wake but gestured at Luke in his car seat to let them know that she needed to take him upstairs. She suspected that more people would arrive within the hour, having stopped off at home or even the pub first, and that some would already be in the cosy lounge. Entering the house had been an assault on her senses as familiar sights, smells and sounds rushed to greet her, but she’d tried to maintain her composure for her grandmother’s sake, although when Granny had made the comment about Luke taking Grandpa’s place in the household, she had struggled not to break down completely. The big old house hadn’t changed a bit in the months she’d been away, but then she hadn’t expected it to be any different. The same aroma of woodsmoke and baking hung in the air, the house still creaked and groaned as the wind moved around it outside and sneaked through the gaps around the white sash windows, and the decor hadn’t altered since Holly had first entered the house in her mother’s arms, fresh from hospital – she’d seen the photographs to prove it. Only … it was different now, because Grandpa was gone. His deep voice used to echo through the hallways, his loud laugh bounced up the stairs, and his anger caused the floorboards to vibrate when he unleashed it. Which wasn’t often, thankfully, but he had been a strict man with old-fashioned values, as well as unrelenting in his pursuit of what he believed was the right way to raise a family and conduct his business. Holly had grown up well aware of these facts. She had loved him – how could she not, when he had such a good heart? – but she had also feared him, and the idea of letting him down. The fact that she had been conceived before her parents married had been a family secret, as if it was something to be ashamed of, but Holly had been aware of it from an early age. She’d heard her mum and grandpa arguing one day, Grandpa ranting about his daughter disappointing him. Her mum’s reply had been sharp and quick: she had given him a beautiful granddaughter; how could he claim to be disappointed with that? Holly had loved to hear her mum debate with people. She had been so intelligent and articulate, and even Grandpa had been forced – on more than one occasion – to swallow his words. Holly didn’t think she was as brave as her mum had been, which was one of the reasons why she’d run away. She hated conflict, and in that way, she was more like her dad than her mum. Bruce tended to bite his tongue and walk away rather than get involved in an altercation, but Holly found that just as admirable; sometimes it took more strength of character to walk away than to stand and fight. Her parents had been so different and yet so perfectly matched, and she loved them both dearly. If only her mum hadn’t passed away when she was so young. Too young to lose her. Too young to know how to cope with saying goodbye. She climbed the stairs, then turned left and walked along the wooden floorboards of the corridor, passing the closed door of her dad’s bedroom and the door to the right that led to one of the two family bathrooms. At the other end of the landing, directly opposite Holly’s room, was her grandparents’ bedroom, and next to it, their bathroom. She turned the handle and pushed at her bedroom door, expecting it to groan on its hinges as it swung inwards, but it didn’t make a sound. Another thing to thank her dad for, no doubt – he’d had the foresight to oil the hinges in order to avoid them disturbing her son. She set Luke’s car seat down on the floor at the end of the double bed. Her room was as she’d left it, a mixture of teenager and twenty-something, with band stickers all over her built-in wardrobe doors – from Madonna to Whitney to Bryan Adams – and posters on the walls featuring Leo and Kate in that iconic pose from Titanic, and Sarah Michelle Gellar in her classic Buffy the Vampire Slayer stance. The shelves on the wall still held her books, and she gazed at their spines, reading the familiar titles: Pride and Prejudice, Salem’s Lot, volumes on business law that she’d bought back in her teens when she was considering a career in that direction. She shook her head at her younger self, at the naïve girl she’d been before her mum had died, before life had changed for ever. 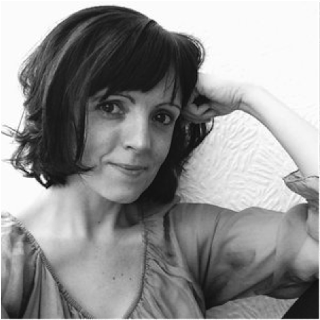 Growing up, Holly had been filled with a zest for adventure that her mum had nurtured, and had believed she’d travel far and become a successful lawyer. But when her mum died, it was as though the spark in Holly was doused, and the idea of straying from Greenacres suddenly seemed terrifying. It was, she knew now, a perfectly natural reaction to her loss, but at the time, she had thought fear would rule her life. Time had helped her to overcome her grief, of course, but she had never been the same. Her plans to go away to university to study business law – which she aimed to use to help her family and other small businesses – were abandoned. She sat her GCSEs and A levels, achieved good grades and had unconditional offers from three universities – in London, Bath and Cardiff – but when it came down to choosing one, she decided not to go. Her dad and grandmother had tried to encourage her to leave and experience a different life, to expand her horizons, but her grandpa had been happy to keep her close. He’d told her once, not long after she’d declined all three universities, that he was glad she’d stayed at Greenacres. He’d lost his daughter and didn’t want to lose his granddaughter. Holly had been happy to have his approval, as it made her decision feel justified. 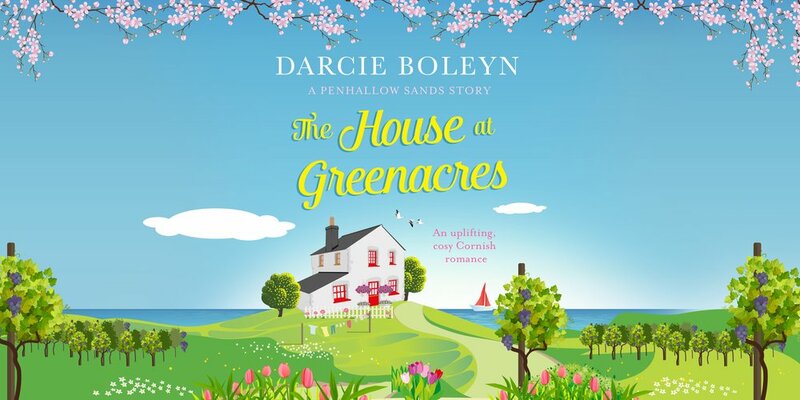 Instead of leaving, she had focused on running the shop at Greenacres and helping out in the vineyard, on being a good daughter and granddaughter and on enjoying a simple life near the village of Penhallow Sands. It had taken something big to make her leave her childhood home, and when she had made the decision to go, she hadn’t known if she would ever return. The large bay window in Holly’s bedroom overlooked the rear garden and the fields that lay beyond. It was a beautiful view and one that she had spent hours gazing at. Her heart fluttered as she looked at it now. Eight months away and such a lot had happened in the meantime; the view was the same, but the family had changed. It would never be the same again. This room had seen so much as Holly grew into a woman: tears, anger and laughter, excitement and love. She flopped onto the bed and ran her hands over the patchwork bedspread that her mum and granny had made for her before she was born. Soft and worn, it had been a constant in her life even when other things had changed. She’d wrapped it around her to keep warm on frosty nights, sobbed into it when she’d been grounded as a young teenager for going night swimming with a group of friends, and later on, when she’d lost her mum. Then, last year, when she’d known that she’d lost Rich too. The bedspread had stayed here when she’d left, almost as if it were waiting for her to return. It might only be a blanket, but her mum had helped make it, and had done so with love for the child that was growing in her belly. Holly knew now how it was to love a child, and how awful it would be to have to leave the world before that child was fully grown. 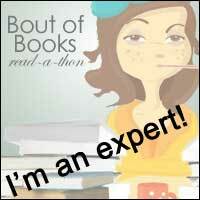 The fluttering in her chest grew into a pain so red hot that she gasped and sat upright. She couldn’t do this at the moment, didn’t have time to grieve for her mum right now. She was home and she had a responsibility to be there for her granny and her dad. Today of all days. But coming home with her own child made her wish more than ever that her mother was here to greet them. Mum would have loved Luke, and knowing that she would never see him was devastating. She stood up and walked around to the cot that her dad had placed on the other side of the bed. It was pine, with a drop-down side, crafted by her talented grandfather. She’d heard the story numerous times about how Grandpa had worked late into the night in the weeks before she was born. He’d been determined to get the finish right, to ensure that no rough edges remained to hurt his precious grandchild when she arrived. The beautiful elaborate carvings on the outside of the cot were of vines and grapes, representative of the business that he would one day pass on to the Morton heir. Grandpa had been dedicated to his family, expecting no less of everyone else than he did of himself. Whether he had expected to have more grandchildren after Holly was something he never mentioned; Holly knew that her parents had wanted more children but it had never happened. So she had remained an only child, adored and showered with love and attention. The cot was already made up with a new mattress, a clean fitted sheet and soft wool blankets. Holly lifted Luke gently from his car seat and laid him on the bed. She removed his jacket and deftly changed his nappy, holding her breath when his eyelids flickered open and a frown passed over his smooth forehead, worried that she’d wake him. When he was dressed again, she placed him in the cot and covered him with a blanket. She watched as he tried to settle himself, but the smells and the mattress were unfamiliar, so she fetched his soft bunny from the car seat and tucked it in next to him, knowing it would be of comfort. There was a quiet knock at the open door and her dad came in. He nodded, then tiptoed over to the cot and gazed down at Luke. A wave of love swept over Holly. Bruce Dryden was such a big man and yet so gentle; he had been a kind and caring father and she knew she was lucky to have him. He had been her grandfather’s polar opposite in many ways: the calm to his storm on numerous occasions. Holly had never clashed with her father over anything; instead, it had been Grandpa who’d evoked the teenage angst and rebellion in her. It had been Bruce she’d told about her pregnancy, and who’d come to see her and Luke, bringing what he could spare to help them out, offering love and support and trying to encourage Holly to return to the vineyard, though not before she was ready, of course. He had been supportive and never judgemental, understanding and never expectant. Now she stepped closer to him and hugged him tight, wanting him to know how precious he was and how grateful she was for his love. When she released him, he kissed her forehead, then quietly left the room. Holly pulled the baby monitor from her suitcase. The first one she’d bought had been a video monitor, but then she’d watched a documentary about people who knew how to tune into the unsecured video links and were able to spy on babies and their families. It had scared her into binning it and replacing it with an audio one. Even if someone could hear her and Luke, at least they couldn’t watch them. Once the monitor had been plugged in and the receiver tuned, she closed the curtains and left the room, pulling the door behind her. If Luke woke and needed her, she could be with him in seconds, but she had a feeling that the train journey and the busy morning had tired him out, and that he’d sleep for a while. Thanks so much to Darcie for stopping by and sharing this extract with us today. Don't forget to go and visit the other stops on the tour!